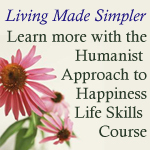 Downloadable version: The Humanist Approach to Happiness is a 6 week course designed to teach you the basic life skills humanists use to lead happy, fulfilling and productive lives. The Humanist Approach to Happiness is a 6 week course designed to teach you the basic life skills humanists use to lead happy, fulfilling and productive lives. I designed this course to help teach the essential life skills humanists use to navigate through the world. These are things you already know are important, like being compassionate, ethical, responsible and how to make better decisions in life. You do not need to be a Humanist to benefit from this course as everyone can benefit from these skills. While I cannot guarantee that you will be happy all the time after taking this course, what I can promise you is that you will have a better understanding of what sort of person you want to be and why. You will probably also find that you have a renewed dedication to living your life the way you already know you should be living it, fully, and intentionally. Before you purchase the downloadable files, please make sure you have a high speed internet connection. At	10MB/s each week takes about 20 minutes to download. If your connection speed is lower than that, or if you use dial up DO NOT PURCHASE this course as a download and please instead choose the data disk or DVD options. You may purchase either the entire set of files or each unit individually. With this download you will be given download codes for 6 different zip files. Each zip includes a wmv video of the lecture along with 2 pdf files. Each zip is about 200MBs in size, so again, if you don't have a high speed connection, don't use this options. The entire download using a highspeed connection can take 1 1/2 hours. Please note: this course is liscenced for your personal use only. If you are interested in presenting this class to a group, please contact Jennifer to make arrangements.